Lotus and I go to the grocery store to mail a package and pick up parsley for walnut pesto (dinner tonight) and grab Starbucks on the way out. Not a big deal, easy stuff. Stand in long line to mail package. With impatient toddler. Usually the post office has the long line, but now the grocery store postal counter has a long line, too. The others have figured out my secret mailing location. 'Tis the season to mail things. We reach the counter and I realize that my package is going to the UK and I had forgotten that the grocery store does not mail anything overseas. Argh. Go to get parsley. And bananas. Lo is either trying to run away from me or holds my leg so tightly that I have to walk with her attached to it. Lady with 30 items steps in front of us in express checkout lane. But it's okay. Stand in line with impatient toddler. Go to Starbucks inside the grocery store, order coffee and walk outside to car. Lo gets upset for unknown reason, refuses to be carried and throws my keys into the snow. I struggle to pick up the keys, grocery bag and Lotus while holding my coffee as an SUV stops two feet away from us (and the stop sign in the crosswalk where we were walking) and impatiently waits for us to get it together. I balance coffee, grocery bag, keys + whatever toys/books child was carrying + child to the car and precariously set my coffee on the trunk of the car. 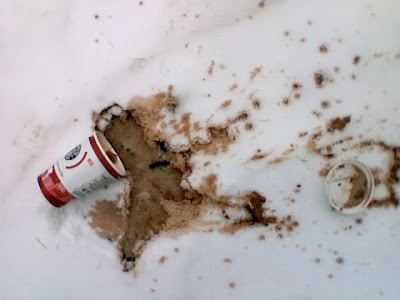 As I get L strapped into the car seat, my coffee slides in slow-mo off the trunk, the lid pops off and my entire cup spills into the snow. Which almost makes me cry. We head off to the post office to mail package to the UK. Sigh. Lotus woke up with a cold this morning, so every time she sneezes, a huge glob of snot ends up under her nose. And every time she sneezes, she's in the car seat and I'm driving. I pull up to the post office, wipe little nose with Kleenex, and can already spot a very long line. I look in my bag and realize I had forgotten to fill out the customs form. Double grrr. The postal workers at this particular branch are always annoyed when you don't fill out the form ahead of time, and I decided I just didn't want to deal, so we leave post office. And so I drive over to the drive-thru Starbucks. Where I order another coffee to try to get over the sadness of losing the first cup. Almost consider telling barista about what had just happened to see if I can get a free coffee but realize the world doesn't work that way. Pay for coffee #2. Rargh again. Beg Bo to come home for lunch, fill out the customs form and run out the door (back to the post office) as soon as he's home. Mail package, drink coffee. All is okay again. Lessons learned: 1. Think before you leave the house (and fill out the customs forms.) 2. Starbucks is the root of all evil. 3. And the post office needs a drive-thru. Sounds like me yesterday. I had a kid on each hand, two back packs, my huge tote bag and a stroller. Went into a tiny cafe to get one child her snack, things are falling, children not listening, people staring. Then hike out into the city streets to hail a cab with all said stuff. I feel for you, I get a little taste of what its like to have children and deal with every day things a few hours a day. i am so sorry about your coffee...and yes! a drive thru at the PO would ROCK! Oh the spilled coffee would have broke my heart too. And it would be beyond PERFECT if the post office had a drive through!!!! Jackson lasts about 5 minutes at the post office. You poor thing. I hate days like that. The post office DEFINITELY needs a drive through. I'd do way more mailing that way! oh man! I also dropped my coffee today...grrrr!!! And I *totally* am delurking to say that the post office needs a drive up or they need to let you print first class international postage online!!!! i just had the *worst* starbucks experience. 20 minute wait, after i ordered two drinks, and once the barista's got it together, one of my drinks was wrong. i was late to work and i didn't even get what i had ordered. starbucks very much is the root of all evil. Hey Jen Renee! (from the other Jen Renee in Ohio :) ) I don't drink coffee but I have had so many days like yours, I think it is really the post office and any other place without a drive thru that is evil. Mommies need drive thrus and extra long arms to wipe noses and pick up stuff that falls while driving. When Lotus takes a nap today, you have to induldge in something just for you... whatever it may be. Hope tomorrow is better. Oh man! I'm so sorry you had to have that kind of day! Hahaha...I couldn't help but giggle while reading that though! Women can handle that well though, maybe a little tear here and there, when no one is looking. Guys couldn't handle a day like that! This was hilarious to read, though I can appreciate the fact that nothing felt hilarious at the time. That coffee shot should make it to Explore. I too once lost a 'bucks in a parking lot...had my 5 year old "hold" it for me while I was fishing for something, probably keys and she dropped it on my feet. Still bitter and it was like 3 years ago. As for the drive thru PO...I've been trying to get that idea going for years. But can you imagine the line? I love that you stopped to take a photo of the coffee (or what WAS the coffee) anyway! that picture hurts my heart. and WORD on the drive thru PO. man, would that make life easier.